Michael Caruso from NBS Sports Radio interviews Keith Bach at Junior Players Golf Academy to learn more about the Academy and Summer Camp Programs. Visit https://www.jrpga.com/ for more info. Mike: I’m really well, you know what, I’ve heard of these type of academies, kind of. Never really explored them, never really had anybody on, so I’m glad we get a chance to talk about that, because it is very unique. Mike: Yeah that’s not too shabby. Let’s just get a big overview, what age brackets are you looking at Keith to go to school and golf. Keith: We have students as young as 12 years old all the way up to 18 years old. I’ve got two boys that have been with us for 5 of their 6 years. They started with us in seventh grade. Their finishing their junior year and they’ll graduate with us. So they will be here for 6 years. Then we also have students that are a little older that just took a year off to go to college after graduation and they’re working on their game as a post graduate. Mike: Now is it in a live in? Is it a housing scenario? Are they housed by people in the area, or do they pay like a regular college tuition room and board? Keith: We have built six houses, they are 4 bedrooms, 4 ½ bath, and we have 2 students per room. So we have six in the house along with a house parent that actually lives with them throughout the year and makes sure that they are not burning down the house (laughing). And make sure they are doing their homework, and not throwing parties and making breakfast for them and making dinner for them. Mike: Ok, so you got them in there, now what are some of the education or the courses that these young adults can study? Keith: Well on Hilton head we have two schools that are involved, the Hilton Head Preparatory School, and we also have the Heritage Academy, the academic students study there from around 8-1 o’ clock each day, so they are working on all their core classes and their electives. They usually don’t have many of those, and then gym is filled with their golf opportunities but they are really focusing on their core academics in the morning and then heading out on the golf course and working on their game with the coaches in the afternoon. Mike: Well as you get into this, I’m not sure what was the original, origination date for this, or how long have you been a school of education and golf. Keith: This is our eleventh year where we’ve combined education and golf together, and what’s nice about it is that we partner with these couple different schools that afford a great opportunity for education, and to be able to further themselves, and get into some great colleges. So we have partnered with other schools that already exist on the island. Some academies are a little different because they have created the school to facilitate their academy students, so the education component from what I’ve heard, aren’t as great as, you know, a school that you partner with. Mike: Yeah , so like I said, there’s plenty to do with the education. I know there’s some regulations and some graduation requirements (laughing), all these kids have to meet, that all these kids have to meet. Boy, if you’re teaching them golf, I’m sure you don’t want to dabble in that part of it. Tango-ing with the state (laughing) on the education part of it. Mike: Ok, so what’s the breakdown basically of, when the kids go to school and when the kids golf. What kind of time frame is divided amongst the two? Keith: So the students will go to school between the hours of 8 and 1 and then they get to the golf course about 1:30, and the train to about 5, and then they actually do fitness 4 days a week. So Monday through Thursday they are busy with the academic components, the golf, the coaching, the on-course instruction, and then they are doing fitness in the early evenings, and then after fitness they go home. They have dinner waiting for them from the house parent. They cook for each house individually, so it just depends on where the students are from and what their favorite meals are, and they collectively figure that amongst all the homes. Then they have a little time to kind of wind down and hang out. We’ve got a basketball court, and they play soccer on the lawn, and they throw the football around, and then they have to be back in around 8pm, and there is a mandatory study time where they have to , you know, hit the books. Mike: You know what, That sounds like a very organized, structured program. And you are going to know better than I, except I had a swimmer, and basketball, and volleyball player come through my family. My daughters are all jocks, and it seems like the more structured, and more laid out it is for them, the better they respond to everything, and do you say? Mike: (laughing) Especially at that age. Keith: The better the structure, I think the better the programs, because the parents really like the fact that little Johnny Is going to be at school all day, and then after school is over he is going to be with a coach, and they are going to be really focusing on their game. Then after the golf component, they are going to be at housing, and they are going to be with their house parents. So they are pretty much supervised throughout the day and all that. Mike: Alright, and what’s the enrollment right now. I don’t know if you want to share that with us or not, where do you expect your enrolment to go at each one of your schools. Keith: We have 36 students on Hilton Head Island and we have the six homes, so we basically have the six in each house, and what we would do, based on the enrollment, if it starts to build then we can build 4 more house. We want to be at a maximum of about a 48-50 students but no more than that. Just because it’s easier to manage that number rather than something over and beyond that. We sell ourselves as a boutique academy where we are more of a team environment and each student has individualized instruction, with people that care for them, and are focused on them daily rather than them being a number and maybe 1 of a 150 kids. Mike: So how many locations do you have Keith? Keith: We have Hilton head which I mentioned we have been here for 11 years. We also just took on an academy site in Orlando at Orange County National, which is just an unbelievable facility, largest driving range in the country, second in the world. So it adds a great facility with the driving range and the two golf courses, and they have a short course. We started that this past August of 2017, so we have a couple students there, but we anticipate having about 12-16 for the up and coming August session. Mike: Now, I’m sure you’re just not drawing from the U.S. Where are you drawing all your students from? Keith: They’re all over the world. So we try to maintain about a 50/50 ratio where we have 50 U.S. domestic students, and then we have 50 percent international students. So we have them from Asia, South America, Europe, Canada, Mexico, so they are literally from all over the place. It’s a nice diverse group. Mike: It sounds like it. It sounds like my daughter’s college. They are from all over the world. Swimming and it’s a smaller school and it’s very international. I think she might be a minority on the swim team. But anyways, it’s really pretty slick if you can vouch for this, you get a lot of diversification you’re touching parts of the world you never touched. When you live and you work with kids like that, then that makes environment, you learn a lot about what’s going on in the world. Keith: Oh, absolutely. It’s great for every one of the kids, because they can learn the culture of different students. I just had a family from China come over, and they love the fact that their son is going to be a part of such a diverse group so it’s really going to enable him to learn English a lot quicker and further his college potential. Mike: Yeah it’s so funny, my daughter roomed with a girl from Greece and then one from Brazil, I said, make best friends, you got great summer vacations coming up. Keith: Oh exactly, that’s what they do, they do that for spring break and summer. Mike: Ok, how big do you want to get Keith, I mean where’se this headed? Keith: Well, like I mentioned, I think numbers like 48-50 is really a good number to manage, and it keeps it as a boutique style and it offers the students the opportunity to gain a lot of individualized instruction, because we focus on a 4-1 student to teach ratio. The average academy out there is usually about 6-8 students, maybe even 10 per one instruction. So their learning time has been a little bit, you know, it doesn’t offer them a great opportunity to learn each day just because of the number of students. Mike: Ok, I guess I was going to jump on, how many more location are you looking for or do you want to expand to? Keith: Oh well, you know it’s a good question because we do have some families that have inquired from the west coast. Out in California and the Arizona areas. Just because they just don’t have anything. The model is not out there so they have to come over the east side. But if I do expand it would probably be in Arizona or the California area just because the weather is so great, and we can draw a lot of students from that neck of the woods. Mike: Well I was going to say, if you’re looking for a place in Arizona, I can direct you to a person who started one with Nick Faldo, and Nick Faldo pulled out or dropped the ball or didn’t continue. They were all setup for the schooling and they do schooling. So anyways, I’m just saying there’s opportunities here, and I’ve only been in the radio business 18 years here, I could be a good network for you. In some kind of direction, and I’m serious about that. There was a school started several years by Nick, and you know how that goes, he had a lot of things going on. I’m going to let that go. Mike: But anyways, hey that’s outstanding. Now I don’t want to get into the money side of it, but I know instead of being full-time. Don’t you have some camps that are available, for people who maybe just want to try this out or take a test or get your toe in the water? Keith: We do, and that’s a good question, because we love to encourage students to spend a week with us, or several weeks with us. Just to gain the experience of what it would be like as a full time student. So we offer camps pretty much every week and we have a big spring break camp session coming up anywhere between the beginning of March to the end of April. Then we roll into the summer time where we have campers come in from all over the world that are training with us anywhere from a week to 2 months. 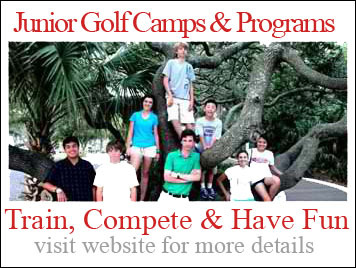 Especially in July we have a phenomenal camp called the Junior Players camp, which allows the students to work on their game, and then test playing in some junior tour events in the south east on the Hurricane Junior Golf Tour. Mike: That’s fantastic, nothing like competition. Let’s talk about your coaches. We have a few minutes left, but I know you’re just not running them out there and turning them loose. How about some instructors? Keith: Our coaches are very seasoned. They have been with the JPGA, the youngest guy has been from 4 years all the way up to 13 years. So they are here for the right reasons, they are really passionate about each and every student. They are really into their teaching. Our structure based on our philosophy is really helping the students with what they have. We don’t have a per say swing that we sell to every student. We try to help with the student’s individual swing and just make it better. Mike: You know, I can just imagine what it’s like. I’m assuming each of these kids, or young folks, have the goal of being a professional golfer along the line. Am I missing that? Or do they just love golf that much, and the education is good because you want the fall back on, but I’m assuming that golf is the #1 priority now. Keith: Golf is #1, it just depends on the family. Some families want the student to really get that great education and golf may be second. Some families like the golf aspect and school is second. But, you know they are really working hard and their goal is to really play college golf, or take it to a professional level in the future. Mike: Yeah, that’s good work. Hey good job, I wish you the best, I hope you fill it up. And I hope you have about 10-20 of these across the country in the world. If kids are dedicated to this and this is what they want. What a great environment Keith. You’ve done a great job. I’m glad we spent a little time together. Keep me posted. We’ll bring you back maybe in about a year or so, and see how everything turned out Keith. Keith: Alright, thank you Mike, I appreciate it. Mike: There he goes. Keith Bach, he is the president. That’s right. The president of the Junior Players Golf Academy. Go to school, do your favorite sport. To learn more about JPGA Programs, visit www.jrpga.com. Golf Tip: Rip It and Grip It!